Here is how I store some of my goodies. First, my Twinkling H2Os. I have a LOT of these and don't use most of them. I may get rid of them someday but for now they fit nicely into these containers. I got these at Joann's. I keep them in two stacks because one tall stack is too tall to fit where I have them. 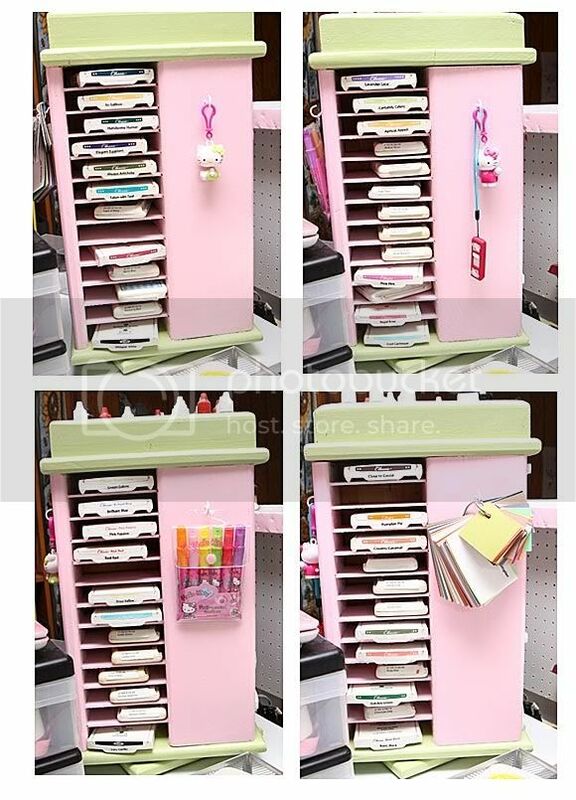 This is where I keep my stickles, liquid pearls and glitter. First of all, I have an L shaped desk. The part where I sit and work is lower and the other part which is to my left is taller. There is a space right next to me where I keep a few things. On the wall of that space, I hung these little drawer organizer basket things to hold my stickles and liquid pearls (on top) and glitter (middle and bottom). This is my ribbon box which is also kept in that space where my glitter and stuff is. I also have my sewing machine in behind there (it's so small I can lift it out easily when I want to use it) and to the left are the containers where I keep my twinkling H2Os and my zig pens (which I never use but my kids do, so I kept them). This is but a small portion of my ribbon. 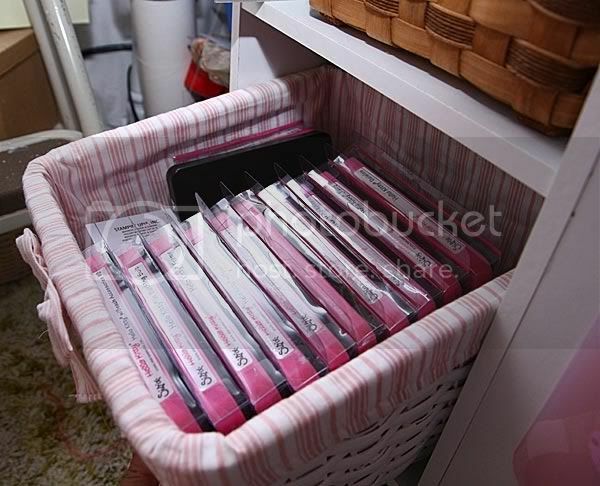 I have a lot of SU ribbon which, as you might know, is on huge rolls and too long to put on this type of storage. That iris cart to the right is underneath the corner of the desk and it holds stuff I rarely use plus my wood mounted Christmas stamps. The blue thing is my trash can. As you can see I stuff envelopes, plastic bags (those giant ones that paper comes in) and cardboard in next to the trash can. This is the side of a metal cabinet that I use to store fabric. It's right up against the end of my desk. 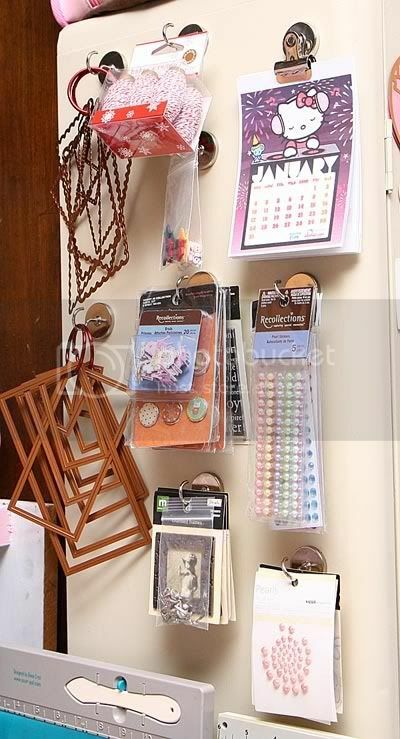 I put these magnetic hooks on it and have a few goodies hanging from them. Stuff that should go somewhere else but I haven't decided where yet. Also my long rectangle nestabilities are here because they don't fit in the drawer where I keep the rest of them. This, to me, is an eyesore so I would like to do something different with these. But they are handy here. 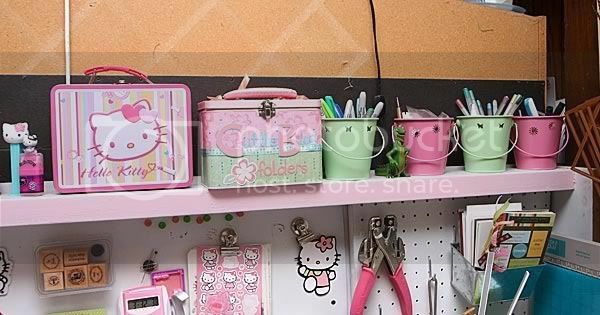 This is a shelf that is at the end of my sewing desk. It is right near my big shot so I keep my big shot stuff in it. 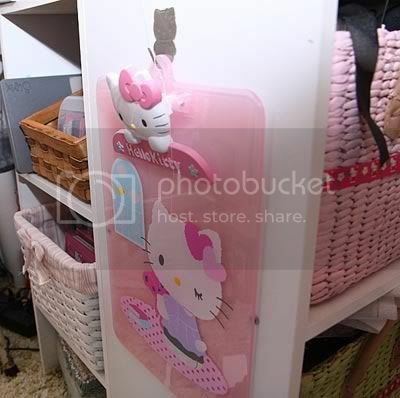 This pic shows the baskets plus my cute HK clipboard which, by the way, is hanging from a cute HK hook that Siobhan sent me. And the baskets showing my stuff. Yes almost every one of those is a Hello Kitty die. I have about 4 or 5 regular dies which don't fit in here so they're in an iris cart drawer. 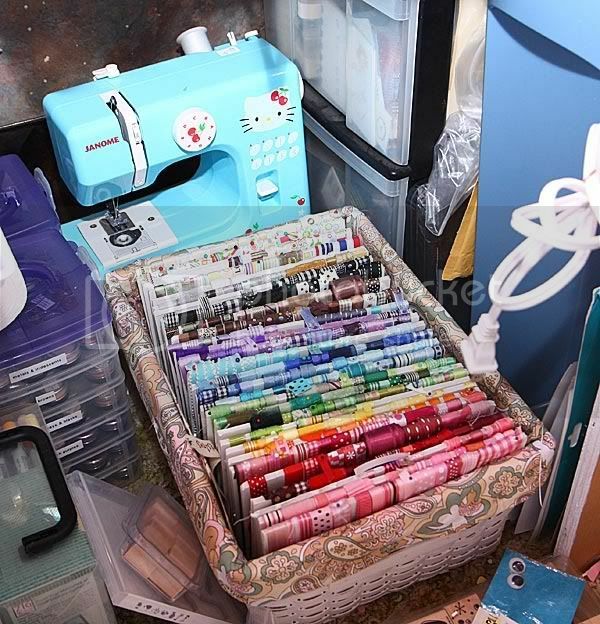 The other basket has a little tupperware keeper which holds my sizzlit dies and embosslits and behind it are my extra cutting pads and the various shims and other cutting pads that I have. I keep my cuttlebug folders in these two tins. Also there are buckets from the Target dollar spot where I keep some pens, sharpies, and other little stuff. Below that you can see the top part of my pegboard which holds a couple of tins plus my crop a dile and you can't see them but my brayers (three of them-I'm sick I tell ya) are hanging there as well. To the left you can see my Hello Kitty pez dispenser and eraser. 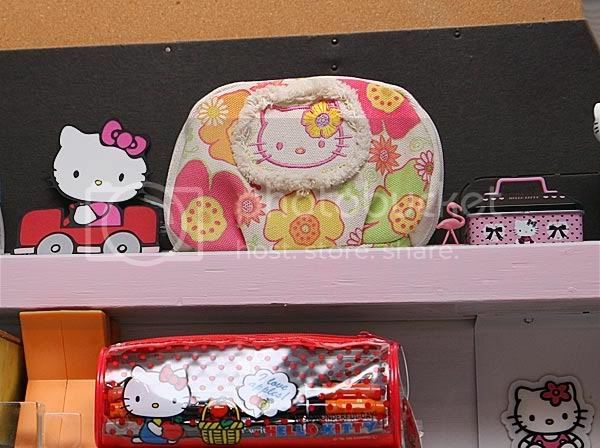 This is actually a makeup case. 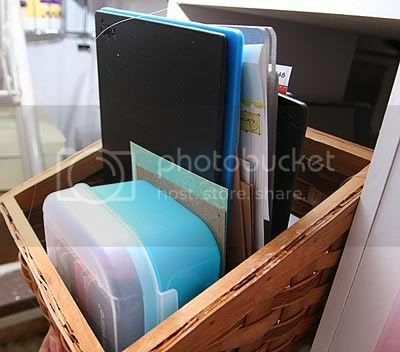 I keep some small post it notepads plus some of those little spiral bound $1 walmart scrapbooks in it. I mostly keep it there because it's cute. 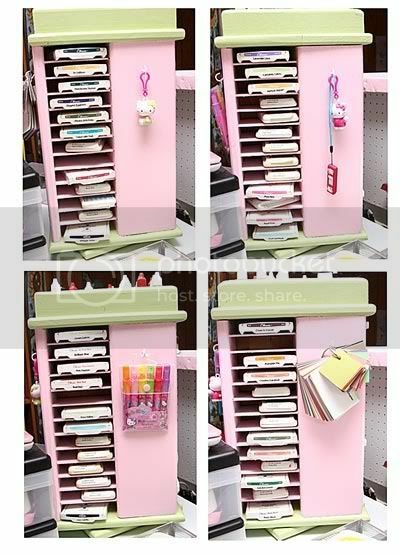 And last of all my Making Memories wall storage thing. 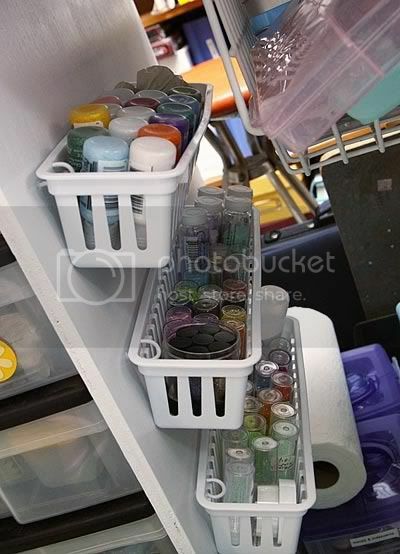 I keep my MM paint, some prima flowers, my background stamp wood mounts, small pieces of ribbon, some spools of ribbon I don't really use (my kids use them), embossing paste, big containers of UTEE, my bazzill swatches, some tins to alter and a few other goodies. Just whatever fit I guess. It is official...I want to come play at your house!! OHHH I was thinking the same thing! I wanna come and play... you have some super fun toys!!! Heck lets make it a sleep over party... you have the coolest stuff! 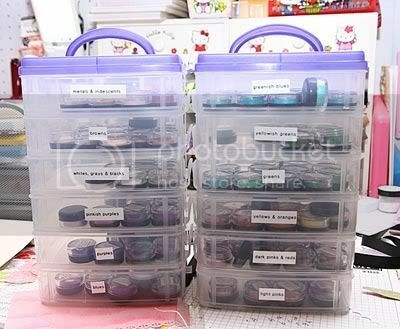 I love to see how other crafters organize their supplies. Thanks for sharing. Everything looks so inviting! Wow. It all looks so pretty! 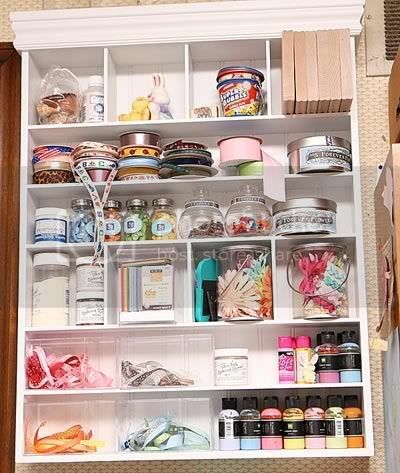 Love the way you store your ribbon! I am so coveting all your storage and organization! What a fun space to be creative in!